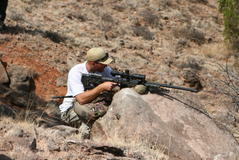 This is a team "hike-and-shoot" rifle match for long-range rifle, semi-auto "carbine," and pistols. It will test a 2-man team's ability to locate, range, and engage practical targetry spread in the terrain using both weapons systems. 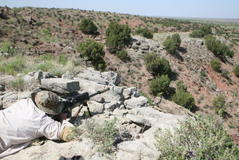 Some of the skills involved include target recognition, ranging, wind doping, ballistic data management, marksmanship under field conditions, non-standard shooting positions, rudimentary trail skills. This match is much easier physically than the TBTC and is more on-par with the Steel Safari. Minimum recommended round counts, 180 rifle, 120 carbine, 100 pistol per member. It is suggested to bring 2-3x more carbine and pistol due to shots permitted rounds for possible re-engagements. 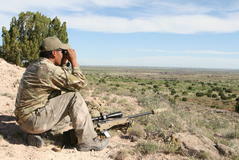 We are seeking a few more RO’s for the upcoming TEAAM SAFARI, held in Logan NM at the Blue Steel Ranch, Oct 18-21. Prior competitors in any of our matches are ideal. As an RO you will be a “LEADER OUT” in the morning (experience with historic field course layout at BSR is a plus) AND/OR you will be an action-stage RO in the afternoons on Friday and Saturday. We need RO’s there on Thursday, mid day, for RO briefings. RO’s may not shoot the T.S. for score, however, will can give you an opportunity to shoot some of the stages for fun. In addition, our RO program gives you credit for a future match. For reference, here is the CD Range Officer Program. 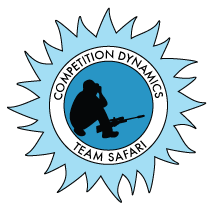 The TEAM SAFARI will be held at the Blue Steel Ranch [BSR], also known as the site of the Steel Safari match. The BSR is located very near to Logan, NM. 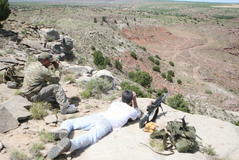 It is a private ranch turned shooting range, with some of the best geography for field shooting available anywhere. Each team shall be comprised of two shooters. One shooter shall be designated the "rifle shooter," and one shooter shall be designated the "carbine shooter." Targets designated as rifle targets may only be engaged by the rifle shooter, with his rifle. Targets designated as carbine targets may only be engaged by the carbine shooter, with his carbine. Each shooter shall shoot the same firearms for the entire match. For the purposes the preceding rule, the "same firearm" shall be defined by a specific combination of caliber, receiver, barrel, stock, grips, sighting device. Unless otherwire directed by the stage RO, team members will stay within arms'-reach while shooting on all stages. Every shot fired without team members in this proximity will incur a procedural penalty. Team members may be separated by more distance while on transit legs. For Assault Stages, team members must be within a pace of each other unless otherwise specified. It is strongly recommended that they stay two abreast while engaging targets in the same direction for safety. Loaded cartridge OAL not to exceed 2.90"
OPEN division carbines are permitted. Must be carried in a holster that will retain the pistol during vigorous activity. Each team member must carry his holstered pistol on designated stages. Pistol must not exceed USPSA's "Limited" division specifications. No optics, no ports/comps! When selecting your rifle and carbine choices, keep in mind that the majority of targets will be reactive armor steel plates. If your load does not have enough momentum to cause a hit indication that is detectable by a spotter, your shot will be counted as a miss. For reference, .243 is known to have acceptible target indication for rifle, and .223 is known to have acceptible target indication for carbine targets. Teams shall use only one carbine, and only one rifle throughout the match. The carbine shooter shall use only one carbine throughout the match. The rifle shooter shall use one rifle. Ammunition and magazines may be replenished at any time. Ammunition that must be "fired" to be unloaded once chambered is declared to be unsafe and may not be used in this match. All firearms must be able to be completely unloaded without firing a round. Teams violating Equipment Rules will be subject to scoring and/or monetary penalties. Fines will be assessed if target damage occurs due to: forbidden bullet types (AP, steel, tracer, etc); disallowed calibers; or exceeding the muzzle velocity limits. In the interest of fairness to all competitors, active night vision devices (night vision optics) are not permitted for use in the night stages. There is no penalty for misses besides the potential points not gained by missing. A failure to engage (FTE) penalty will be assessed for every target not engaged by the time the team moves past the target's shoot position. The team may not back up. The RO determines and has final say if shooter engaged a target or not. A procedural penalty will be assessed for failure to follow directions on appropriate stages. Procedural and FTE penalties will cause -5 points to be applied to the stage score per infraction on appropriate stages. The match director may apply scoring penalties up to full match disqualification for match disruptions caused by competitors or inividuals in their party, on his discretion alone. Note: rules are subject to change up until the match date.